In September this year, 3-year old Loyal quickly turned from a carefree kid at home in the morning, to a child fighting for life in the afternoon. Seeing him rushed through Northern Hospital’s Emergency Department unresponsive and blue, his parents thought they might lose him. After receiving the best possible care at Northern Health, he pulled through the night. However, the life-threatening asthma is still there, and the walls of Northern Hospital’s Children’s Ward have become very familiar to him. Loyal is one of 22,000 children who present to Northern Hospital’s Paediatric Emergency Department every year, many of them sharing a similar, life-threatening story. That is why we know how traumatic it is for parents to see the lives of their little ones on the line. We also know how scared and confused children like Loyal feel when they are rushed through our doors, as our staff in the Paediatric Emergency Department see more than 60 children every day. This Christmas, we encourage you to give generously to the Northern Health Foundation and help the growing number of children in Melbourne’s north receive the best possible care close to home. 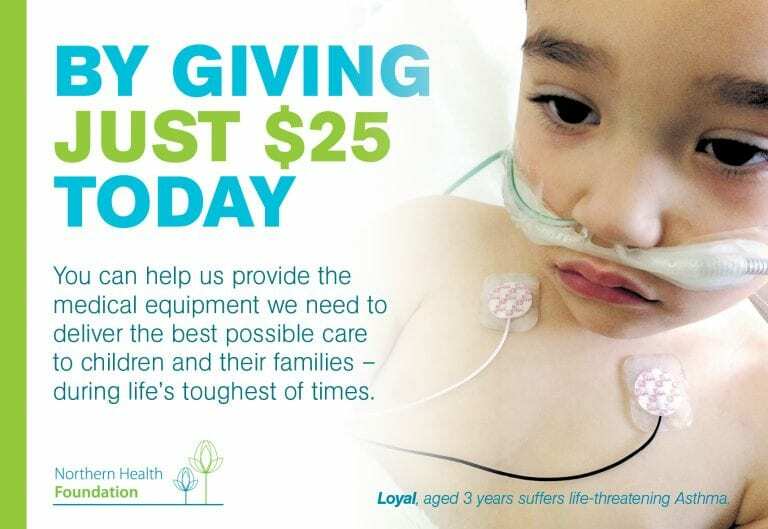 By giving just $25 today, you can help us provide equipment and resources we need to support families and continue holding their hand, bringing comfort in deep distress.